Jim’s Pest Control is our newest client and comes via referral from Jim’s Mowing after finishing the new Jim’s Mowing website redevelopment late last year. 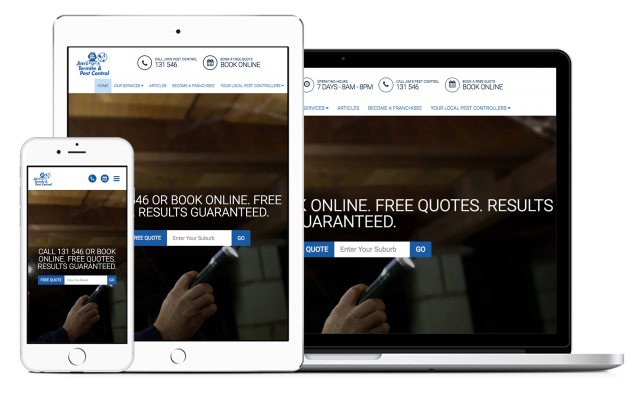 Webtron recently modernised the website for Jim’s Mowing, and via referral, we’ve created a similar design for the Jim’s Pest Control Franchise. It’s all a part of modernising the group-wide Jim’s brand online. Find our latest Jim’s site at www.jimstermitepestcontrol.com.au, or view our site for Jim’s Mowing here.